Obsidian is a grounding stone but also contains a fiery element. It is useful for developing the strength needed to stand on your own convictions against any enemy. 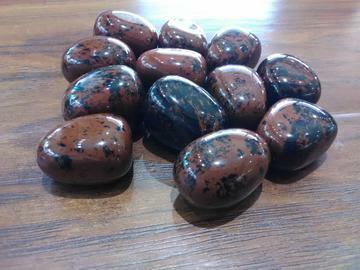 Mahogany obsidian has a gentle energy that will ground and protect its owner. Use it for strength in times of need, to remove energy blocks, and give new life to your purposes and goals. Healers use it to relieve pain and improve circulation.